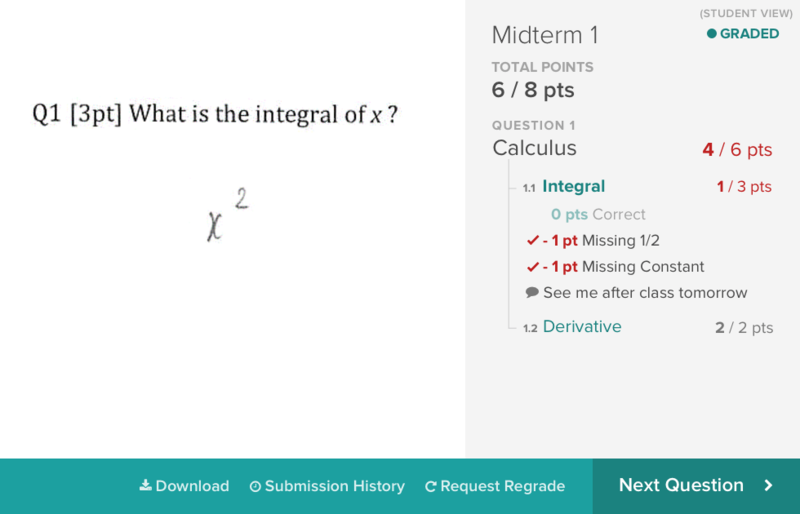 The first 5 instructors at each institution get free access to Gradescope Basic for Teams forever. All others get their first two terms free. Create answer groups to grade even faster. Cut grading by 70% or more with the help of AI. For solo instructors who want to ditch their red pens and grade faster online with the original version of Gradescope. 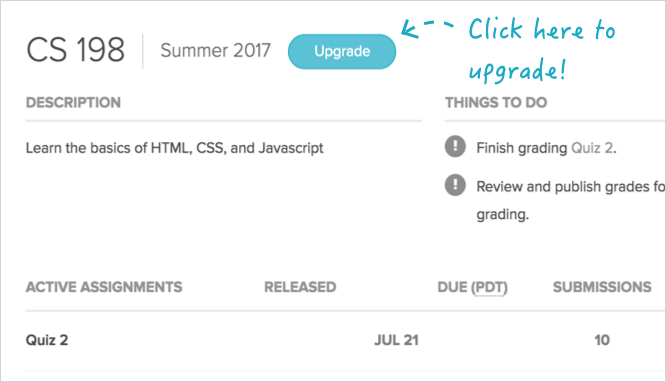 For teaching teams seeking a faster, effective grading experience with the original version of Gradescope. 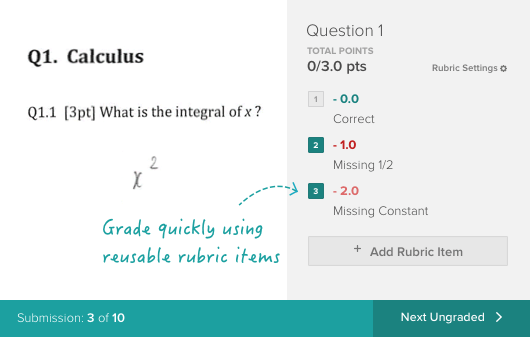 For individual instructors who want to grade faster and better understand what students learned. For teaching teams who want to streamline grading and increase consistency with shared rubrics. For institutions needing LMS integration and advanced analytics. Our goal is to reduce the cost of high quality education. If you don't have access to funds, put us in touch with the appropriate decision maker at your institution. We'll advocate on your behalf and give you access in the meantime. Grade a single set of assignments in parallel with collaborators without risk of error or redundancy. Use Gradescope with your entire teaching team. Tag questions with learning objectives, and view class-level performance by objective. Manage regrade requests quickly online. Easily export grades and rubric item data in CSV format. Effortlessly track when students submit even after the deadline of an assignment. For Gradescope Basic courses, importing rubrics is restricted to courses within the same term. Import rubric items and grading settings from another question. Grade all similar answers at once in Gradescope-created groups. Automatically and manually grade programming assignments. Let Gradescope automatically grade your bubble sheet assignments. Type comments directly on student submissions. Is a credit card required to sign up for Gradescope? No. Start using Gradescope for free by signing up here. We offer a risk-free 30 day trial. If you have used the product for 30 days or less and aren't happy with it, reach out to us and we’ll refund 100% of your payment. How can I try the Complete version of Gradescope? Contact us, and we'll set you up with a trial. How do I know if I'm one of the first five users to sign up from my school? Sign up for Gradescope or - if you're an existing user - send us an email at help@gradescope.com, and we'll let you know! What do you mean by 'term' in the trial length? A term is typically a semester or quarter and depends on your school's academic calendar. If you use a different calendar, your trial will last for one full academic year. How can I use Gradescope if my institution is short on funds? We want everyone to have access to Gradescope and offer grants to ensure that can happen. Contact us to learn more and to apply. or reach out to us. 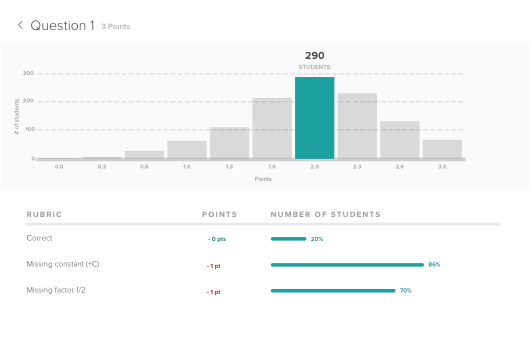 Gradescope works for both instructors and students. Are you an instructor or a student? Please navigate to the course that you would like to upgrade and click on the upgrade button on the Course Dashboard. Let us know who the appropriate decision maker is at your institution, and we'll tell them all about Gradescope.